Now, as promised, a special comment about Dynamo Pro Wrestling at the Stratford Bar & Grill in Fenton on December 6th. DISCLAIMER: I’m biased. Deal with it. The busy weekend continued with Dynamo’s final event of the year. They had a great turnout, mostly in support of the upstart challenger to the Dynamo Pro Title. 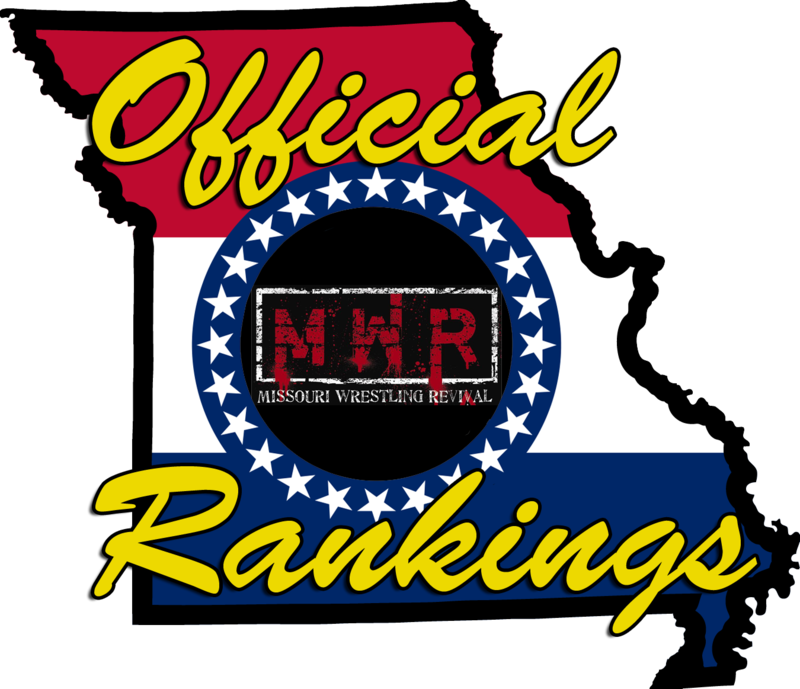 The area’s talent was spread across this card, MMWA at South Broadway (separate commentary to come), and Metro Pro in Kansas City. Your ring announcer was Chris Roedel; your referees were Jay King, Patrick Hook, and Richard White. Brandon Espinosa started the event, complaining about being left off the card while some rookie punk got the title shot at Ricky Cruz. That brought out Cruz, but Espy backed off and said he would go to “7th Street” where he was a main-eventer…all righty then. Ricky threw out a joking line about “where the big boys play” before turning his attention to Mike Outlaw…Outlaw came out and Cruz acknowledged that he had a hand in training him. Of course, he taught Outlaw everything he knows, but not everything Ricky Cruz knows…and in one final lesson, Ricky slapped him HARD before leaving the ring. Brandon Aarons vs. “The Alternative” Ozzie Gallagher: Gallagher changed his name out of disgust over sharing a first name with his long-time rival; he was introduced as “Ozwald Gallagher” at PWE the previous night. (To be fair, there ARE a lot of Brandons in the wrestling scene around here…MARKET CONFUSION~!) These two have gone back and forth over the course of 2014, though I think Aarons has the edge in the overall series. Aarons won a solid matchup with his version of the Burning Hammer in 4:38. High Level Enterprise (Jack Gamble & Jon Webb) vs. “The” Evan Morris & “The New Hotness” Danny Adams: Yay for matching tag team gear! The emphasis on tag team wrestling was pushed on this night with three tag bouts…the outcomes may determine the pecking order as it relates to the next shot at the belts. This one could have realistically gone either way, but HLE overcame a spirited effort by the new duo of Morris & Adams. Webb pinned Morris after a second-rope moonsault in 12:55. Keon Option vs. “Ironman” Ken Kasa (w/ Travis Cook): I mentioned the notable fanbase for Outlaw, but Option had quite a few fans in Fenton as well. We could use a promo segment to establish his “Straps Down University” catchphrase…Travis had trouble figuring out the “K.O., S.D.U. !” chants. Option is still very new, but he’s looked decent in his first few outings…even thought he had just recover from the surgery he got at the Chagrin BLVD. Alas, the dreaded rookie mistake came back to bite him as Kasa avoided a blind cross-body off the second rope…that led to Kasa hitting the John Wu Dropkick to win in 10:45. Intermission! I’m trying to cut back on the sugary stuff and caffeine, so balance between soda and water is a good way to go (leaning toward water). Still working on the whole healthier-diet thing, including (gasp!) salads. I’m not about to get on these diet pills for teenagers, so I’m looking for whole foods as a base. “The Madman” Paco Gonzalez vs. Elvis Aliaga: This was a solid matchup but the fans didn’t seem to be into it for whatever reason…not sure why. Paco has had a fan section at recent events, but maybe they weren’t in attendance for this one. There was one scary moment where Paco did a running plancha and nearly crashed and burned as he caught his feet on the top rope…thankfully he seemed okay afterwards. Aliaga won clean with the T.C.B. (Falcon Arrow) in 9:01. “Dirdey” Jake Dirden & Jackal vs. The Professionals (Shawn Santel & Mauler McDarby)(w/ Travis Cook) for the Tag Team Title: So if Santel & McDarby would have won the belts, would the Black Hand Warriors have gotten the first title shot? Inquiring minds want to know. Dirden & Jackal are the most recent Unlikely Duo™ to hold tag team gold in professional wrestling as Dirden was a substitute for the injured Rocket Mapache in the match where the belts changed hands. Travis wanted to get “his” belts back, regardless of which team did the job. Good tag team matchup here; Jackal got the win out of nowhere with a ‘rana on McDarby in 10:30. The Professionals did the post-match attack, but Mapache came out with some sort of metal weapon in hand (ring wrench?) and that momentary distraction allowed Dirden and Jackal to fight back. “The King of Chaos” Ricky Cruz vs. Mike Outlaw for the Dynamo Pro Title: Outlaw has been one of the most impressive Dynamo newcomers in 2014. 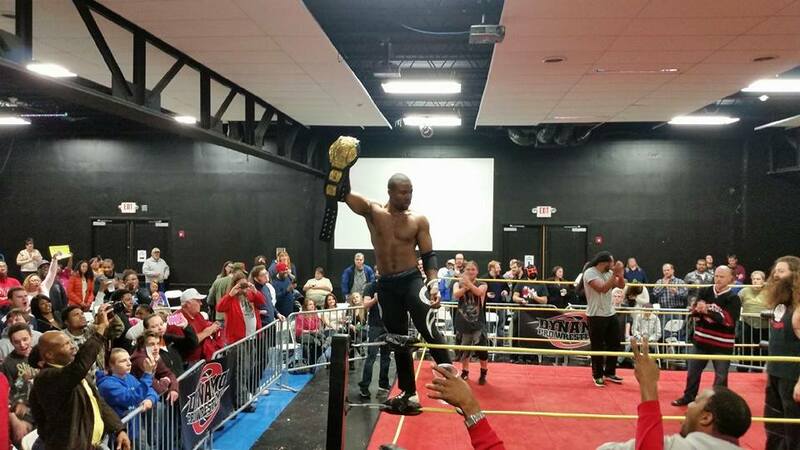 Last month, Dynamo did a unique gauntlet-style matchup with competitors who had never challenged for the Dynamo Pro Title…the winner was guaranteed a championship match and Outlaw capitalized on that opportunity to earn his way to this main event. The atmosphere was off the charts for this one. I thought about the possibilities of Cruz cheating outrageously to hang onto his title, Cruz retaining via cheap DQ or countout, or even a time limit draw (which would have been my second in as many indy events for the weekend). It was the veteran champion against the upstart challenger…as you might expect, overconfidence proved to be Ricky’s undoing on a few occasions. He doesn’t go to the top rope very often and that backfired on him as he got slammed to the mat, leading to Outlaw hitting the Macho Elbow for a near-fall (That needs a name…”High Noon”, maybe?). He followed up with his middle-rope springboard European uppercut for another close two-count. Cruz cut him off with an eyerake and backcracker…for two. Superkick…for two. Outlaw rallied back with a somersault plancha, then hit another Macho Elbow…for ANOTHER two-and-a-half count. Ricky cut him off again and hit the Cruz Control (swinging fisherman buster)…for 2½! If anyone has kicked out of that before, it hasn’t happened often…Ricky lost his cool and stormed back to the dressing room, returning with a steel chair. However, that backfired on him as Outlaw avoided the swing, then dropkicked the chair back into his face. The third time was the charm as Outlaw hit his third top-rope elbowdrop of the match and that was finally enough to seal the deal in 21:00, making Mike Outlaw the new Dynamo Pro Wrestling Champion! Cruz grabbed the belt away from the referee, but handed it over to Outlaw before exiting without incident…after that, much of the locker room came out to celebrate with the new champion. It was a really cool moment and Drew described it as a “feel-good” moment in an industry that doesn’t have nearly enough of them lately. That especially holds true in this era of “pay yer dues,” “it factors,” “intangibles,” “brass rings,” etc. Between SLA and Dynamo this past weekend, I got to see two really fun main events that were two completely different kinds of matches. It says a lot about the different products within this one wrestling scene and the variety that’s available to wrestling fans…there’s plenty out there if you’re willing to look for it. MMWA had its final card of the year at South Broadway on Saturday…I hope to do a full commentary on that once I’ve watched the online video. Good night, good luck, and #yaywrestling.